Asian Carp: Can't Beat Them? Eat Them Asian carp, an invasive species, are making their way up the Mississippi River and its tributaries, edging out native fish along the way. Faced with dwindling supplies of their old catch, some commercial fishermen are shifting course: They're now cruising for carp. Commercial fisherman Jeremy Fisher yanks a bighead Asian carp out of a tangled mess of nets before it joins the rest of the day's catch in the bottom of the boat. Scroll down to read about efforts to keep Asian carp from entering — and altering — the Great Lakes ecosystem. 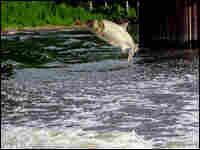 Silver Asian carp are giant, skittish fish. This one lept out of the water in the wake of a fishing boat traveling up the Illinois River near Henry, Ill.
Boaters, water skiers and Jet-skiers occasionally have been injured by leaping 20-pound fish (the average size of Asian carp in the Illinois and Mississippi rivers). Some have been knocked off their personal watercraft: One woman jet-skiing near Peoria a year ago reportedly suffered a broken nose and a broken arm when hit in the face by a flying silver carp. Some observers say there hasn't been a noticeable decrease in recreational traffic on the Illinois and Mississippi, but others say people do tend to avoid areas where the carp are thickest. One man told me heard of some people putting up bars of cages on the boat sides to protect passangers, but I can't confirm that. On a lighter note, in a small Illinois River town called Bath, Ill., a riverside bar sponsored what it called a "Hillbilly Carp Tournament." Some 20 or 30 boats went out to see how many jumping Asian carp they could get to land in their boats. I'm told the winner had 100 make the landing in just an hour. 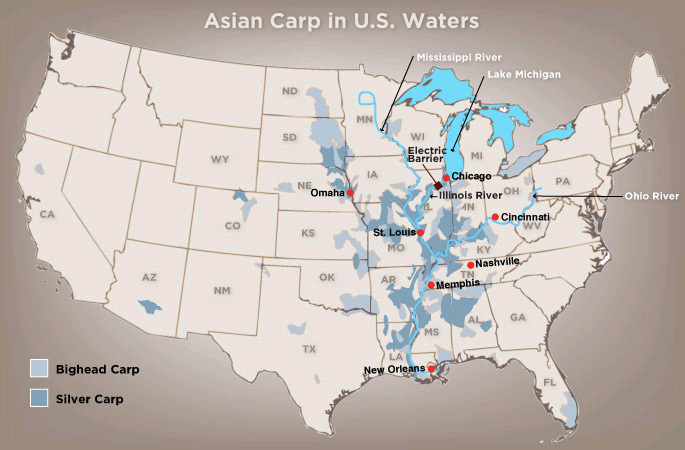 In the Midwest, Asian carp are making their way up the Mississippi River and its tributaries. The foreign invaders can grow to be 80 to 100 pounds. They're ravenous eaters, consuming up to 40 percent of their own body weight in plankton each day. And they're bullies, pushing out weaker, native species. The good news: An electric barrier has kept bighead and silver carp — the two most aggressive types — from advancing beyond a lock and dam on the Illinois River, about 50 miles southwest of Chicago. For now, they have yet to enter Lake Michigan and the Great Lakes ecosystem. But downriver, bighead and silver carp are rapidly taking over parts of the Illinois. And one way to control the population can be phrased this way: "If you can't beat 'em, eat 'em." 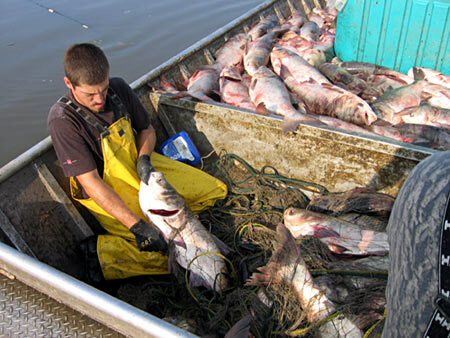 Asian carp were introduced to the United States in the early '70s to control algae in catfish farms in the South. Floods washed them into the Mississippi River in the 1980s. They've worked their way upriver ever since. 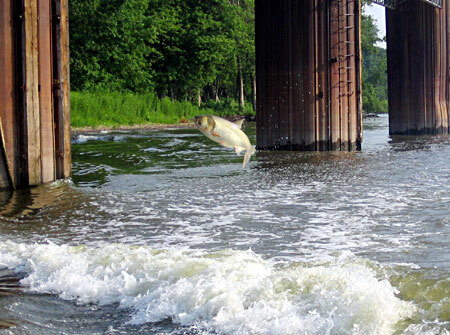 The carp thrive in the Illinois River, a tributary of the Mississippi. For the past five years, Eric Leis has been part of the U.S. Fish and Wildlife Service "carp corral" teams. They net fish in various locations on the Illinois to determine how far upstream Asian carp have moved and how fast their population is growing. Leis says this year, there are more Asian carp than ever before. Biologists with the Illinois Natural History Survey see initial signs that Asian carp may be starting to crowd out two native species of fish — gizzard shad and largemouth buffalo. Commercial fishermen agree. "We used to fish for Buffalo and stuff, and we'd catch these [carp] accidentally," says commercial fisherman Orion Briney. 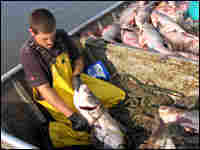 He says bighead Asian carp began filling his nets several years ago and quickly cut into his ability to make a living. So the third-generation fisherman changed course. And now the carp are Briney's bread and butter: He focuses his fishing on Asian carp. The fish weigh at least 15-to-25 pounds each, and some are much larger. They fetch about 14 cents a pound. That's not a lot, but Briney says the huge volume of carp he catches more than makes up for the low price-per-pound. Since he started fishing for carp, Briney says he's doubled his income. Briney used to think carp were ugly. "But now, I think they look pretty good," he says, laughing, noting that they bring "about $4 a fish." On a recent day, Briney and his stepson, Jeremy Fisher, took in about 10,000 to 12,000 pounds of Asian carp from the Illinois River. Their catch ended up at Schafer Fisheries, a processing plant in Thomson, Ill.
Plant owner Mike Schafer has spent the last seven years developing a market for Asian carp. He says his company sells more than 2 million pounds each year — mostly in Asian-American communities in California, New York and Chicago. The carp now account for 20-30 percent of Schafer's business. He hopes that a new flash freezer he invested in will help him start selling to China and other Asian markets. Illinois State Senator Mike Jacobs also wants to expand the market for Asian carp. For one thing, he'd like to see it on the menu in state prisons. "Some people say that smoked, it's better than salmon," Jacobs says of Asian carp's taste. But the name "carp" is likely putting non-ethnic Americans off trying the fish, he says. "Chilean Sea Bass wasn't always known as Chilean Sea Bass," Jacobs notes. "There was a time it was known as a Patagonian Toothfish, and people wouldn't eat it." His suggested name-change? "I'm from Rock Island, so I'm thinking of 'Rock Island Sole,'" Jacobs muses. "Schafer Fisheries is near Savanna, [Ill.,] so Savanna Sole might work, too." Imported from China in the '70s, silver and bighead carp have now spread throughout the Mississippi River basin. An electric barrier has so far prevented them from entering the Great Lakes. Click enlarge to see where they've been found. The last, best hope for keeping voracious Asian carp out of the Great Lakes appears to be an electric barrier on the Chicago Sanitary and Ship Canal, which connects the Illinois River with the Chicago River and Lake Michigan. Though fast-moving and fast-multiplying (some call carp the "rabbits of the water"), the fish apparently still haven’t advanced past the Brandon Road lock and dam near Joliet, some 50 miles from the mouth of the Chicago River and the entrance into Lake Michigan. There is real concern that the invasive species could seriously alter the food web and the entire ecosystem of the Great Lakes if they ever get through. "Asian carp [pose] one of the most serious threats to our way of life in the Great Lakes region in the next 100 years," says Cameron Davis, executive director of the Alliance for the Great Lakes, a non-profit advocacy and educational organization. Biologists and ecologists say Asian carp consume massive amounts of phytoplankton and zooplankton -- as much as 40-percent of their body weight or more each day. That's the same food source relied upon by many native fish species and other aquatic life. Competing with carp would put native species at a huge disadvantage. Asian carp can grow to 80 pounds, and they reproduce rapidly: Females can carry up to 2 million eggs. "If carp get into Lake Michigan, it has the potential to completely undo the food web, much like a computer virus can wipe out a network," says Davis. “We’re like a computer system without an anti-virus." At stake is a $4.5 billion-a-year fishing industry. A temporary and experimental electric barrier was put in place four years ago on the canal near Romeoville, about 30 miles southwest of Chicago, in hopes of turning back the Asian carp. It consists of 13 cables across the bottom of the canal that send electric impulses at split-second intervals to startle and turn back fish. In trial runs with common carp, the experimental barrier has appeared to work well. But it is beginning to corrode, and one of the 13 electrodes has failed. A new, bigger and more powerful electric barrier is being constructed; last month, Congress appropriated $10 million for its completion and operation. The new, permanent barrier consists of 46 electrodes. It would create a much stronger electrified field, three times larger than the experimental one. Still, the barrier won't be foolproof. Some observers fear the powerful wake left by big barges could pull fish through the barrier, or that Asian carp larvae could ride along like stowaways in ballast tanks and be discharged into the Great Lakes.